This is not an original idea folks. 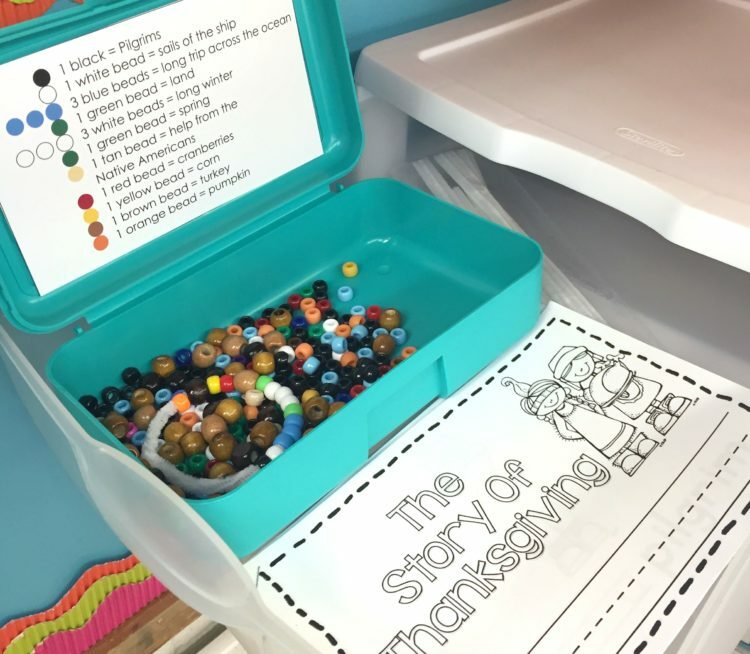 The act of retelling the story of Thanksgiving by using beads has been so many times that I don’t even know who to give credit to . . . honestly. 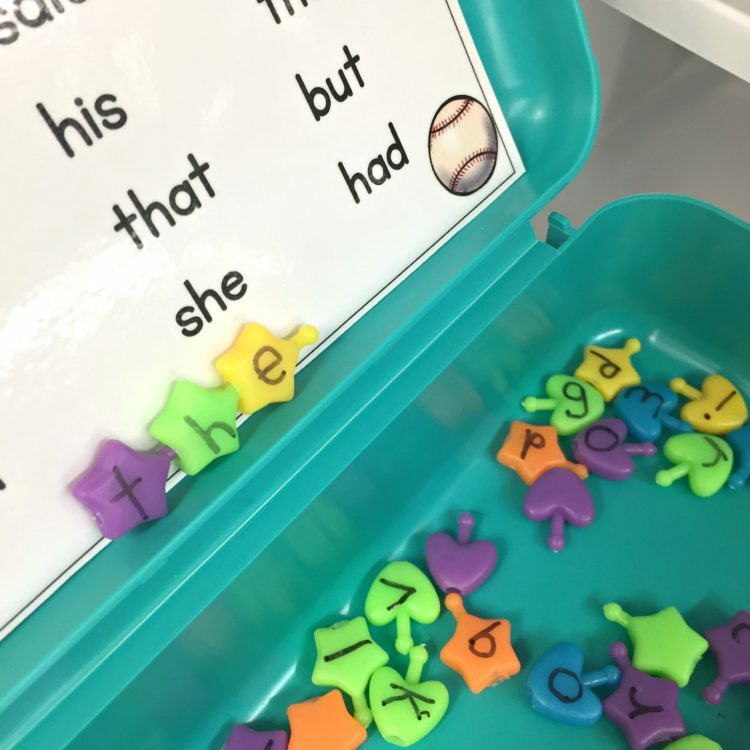 I have been doing it since I started teaching kindergarten and have added different little readers to go along with them. This little reader is actually part of my Thanksgiving Word Work pack. But I’ve actually made it available for you for free at the end of this post. 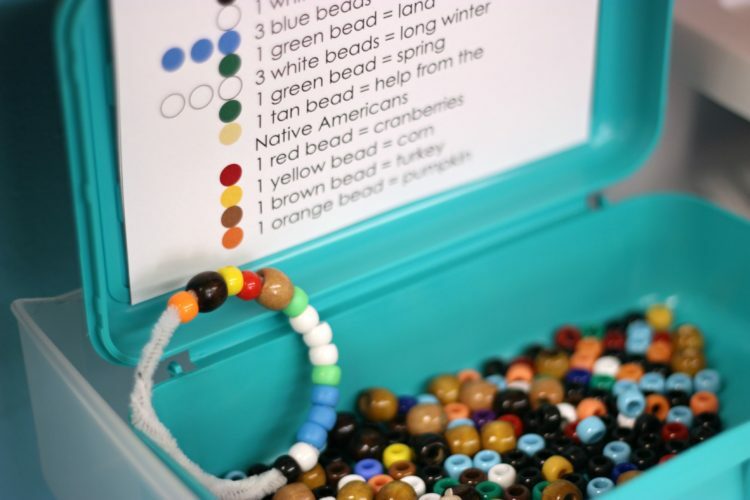 The beads are a retelling activity with or without the addition of a reader though. I simply have the beads available and some visual aids. The reader is a very simple ‘I see . . .’ reader so most of my students can do it without assistance. They read the story and then we string the pony beads onto a pipe cleaner. And there you have it. I love hearing from parents when my kinder friends can go home and explain what each bead represents. 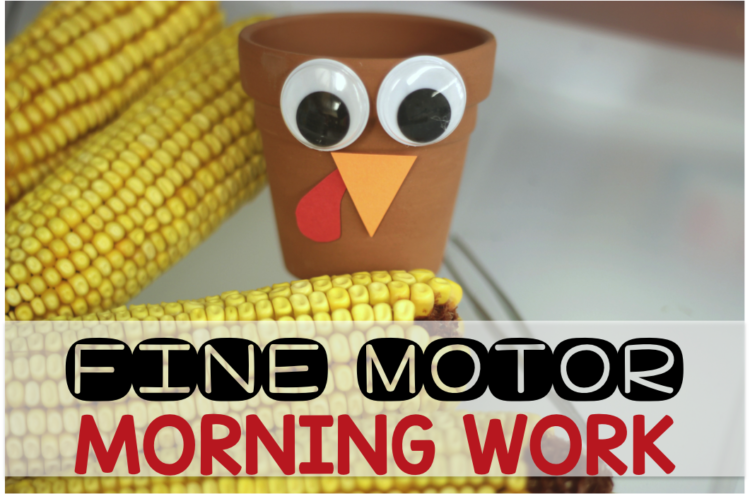 Krissy Miner has put out a new set of Thanksgiving Pokey Pin activities and, since my kinders LOVE this activity, I keep including it into morning work. Simple copy off the sheets and attach them with a staple or two to a piece of construction paper. Students poke out the word and picture with a push-pin. When they are done, remove the top sheet and they can see their design but holding it up to the light or taping it to a window. I’m not sure I’ll ever eliminate therapy putty from morning work. It is THE best. My students really enjoyed ‘saving the aliens’ last month. So this months I have hidden some pumpkins in the different containers that I have. This time they will take the pumpkins out and place them on a ten frame mat and record the number they find. It’s just a simple mat from my November Sensory Table pack and it worked out great for this activity too. Here’s an activity that I saw on Pinterest and revised a bit to make it fit the skills my students are working on right now. or read the word family word (We are through the short ‘a’ families so that’s the ones I’ve included.) before they can place that block on their tower. If a tower falls, you are out and the game starts over. 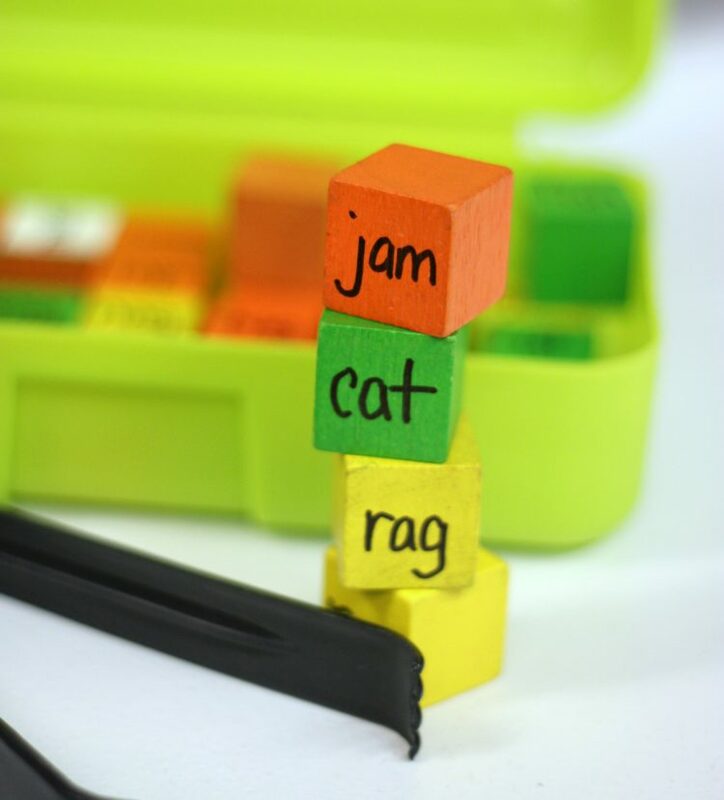 I simply wrote the letters and word family words on some old colored square wooden blocks I had lying around. Super Simple. 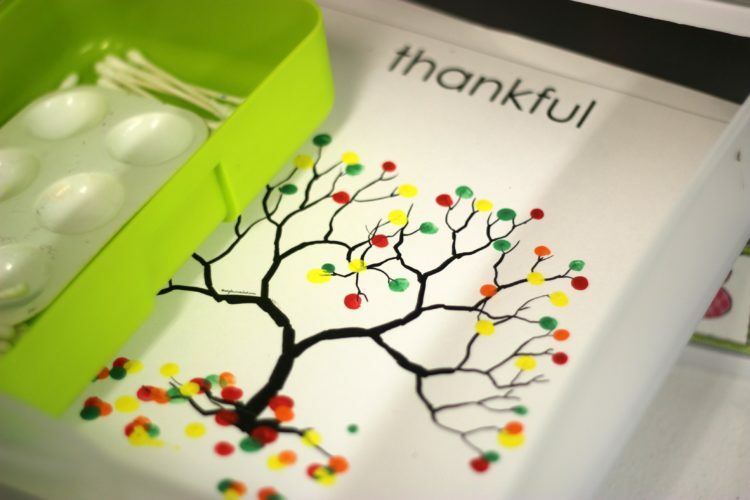 Just because I love these ‘thankful’ trees and I think it really appeals to the artistic learners in my class as well as building fine motor, I have students using q-tips to ‘dot’ different colored leaves on their trees. I have been using this template and idea after seeing is several years ago on Apartment Therapy. I know the original template came from Style Unveiled. However, when I went to find the link for you all, I couldn’t locate it. So, I put one together for you incase you need it. Granted, it’s not as stylish as the original, but it will work in a pinch if you need it. Spinners are fast becoming a favorite amongst my kinder friends. This activity is a count and color coloring page. We are really trying to master those ten frames and be fluent, so I’m using this quite a bit this time around. Here they spin, count the number and find the corresponding numeral on their coloring page and color that space. 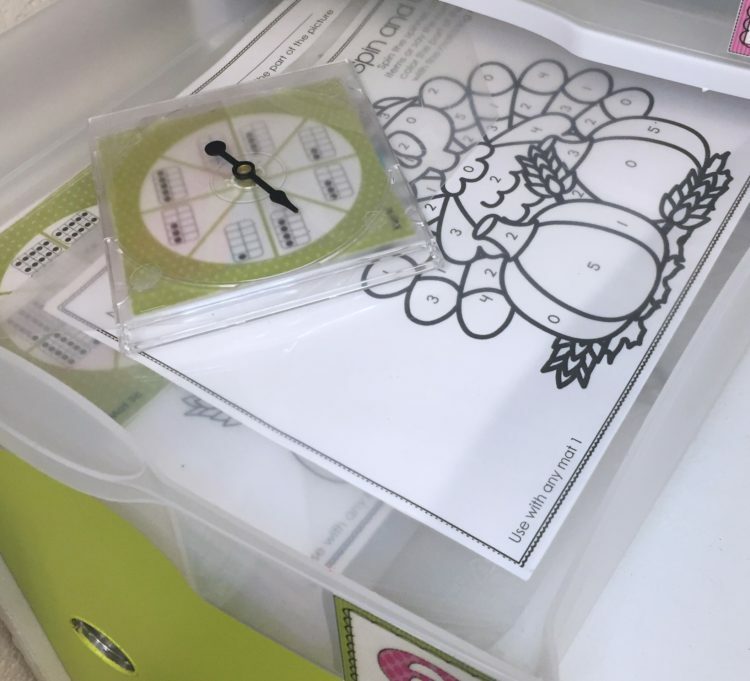 You can find these activities in my November Math Spinner pack. Remember if you’re looking for transparent spinners you can get them HERE and then simply hot glue or tape them to the front of a cd jewel case for easy change out. I’m always trying to make ‘now and then’ concepts more ‘real’ to my students. 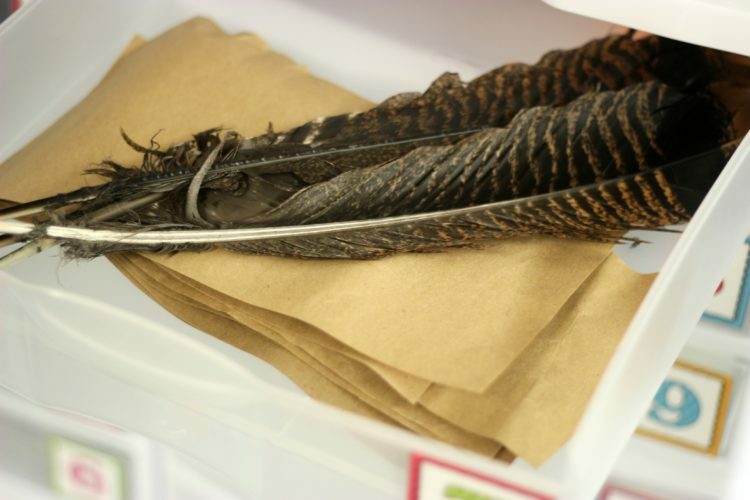 While I get that writing with turkey feather on brown paper isn’t exactly like how the pilgrims did it, it gives them kind of an idea of it. My 84 year old mother tramps through the woods to get me some every year (She’s so good to me!) 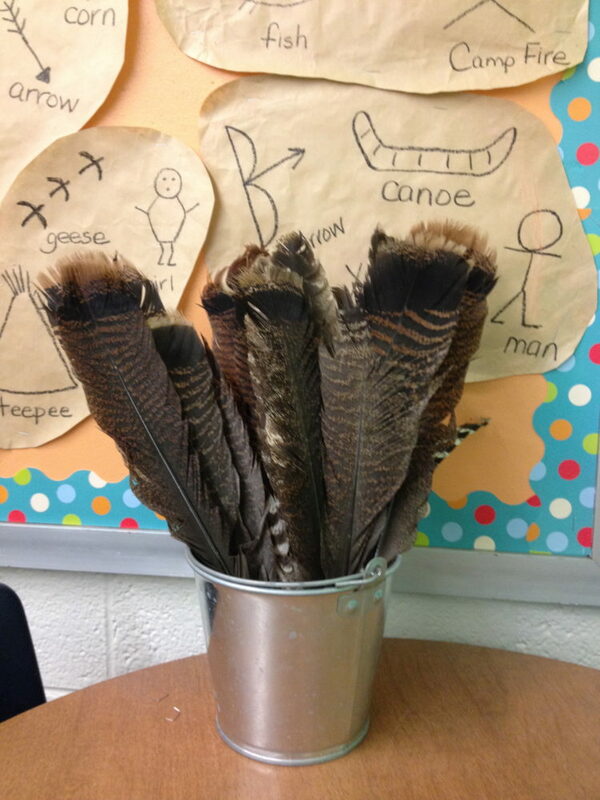 I love that I have been able to give them these authentic feathers to explore pictographs in the past and I thought it would be fun for them to use them to also practice their ball words. They will simply grab the ball word level they are currently practicing and write those words with the feather and ink (I use diluted black paint.). 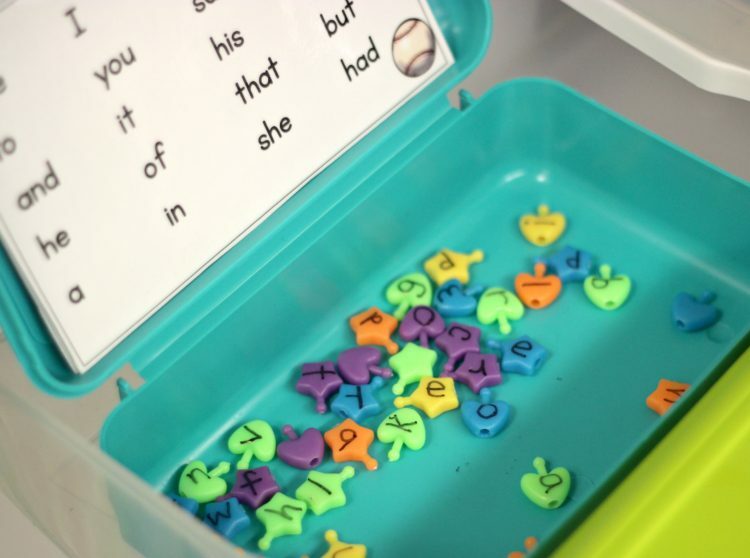 You can find out more about Ball Word Sight Word Mastery system HERE. 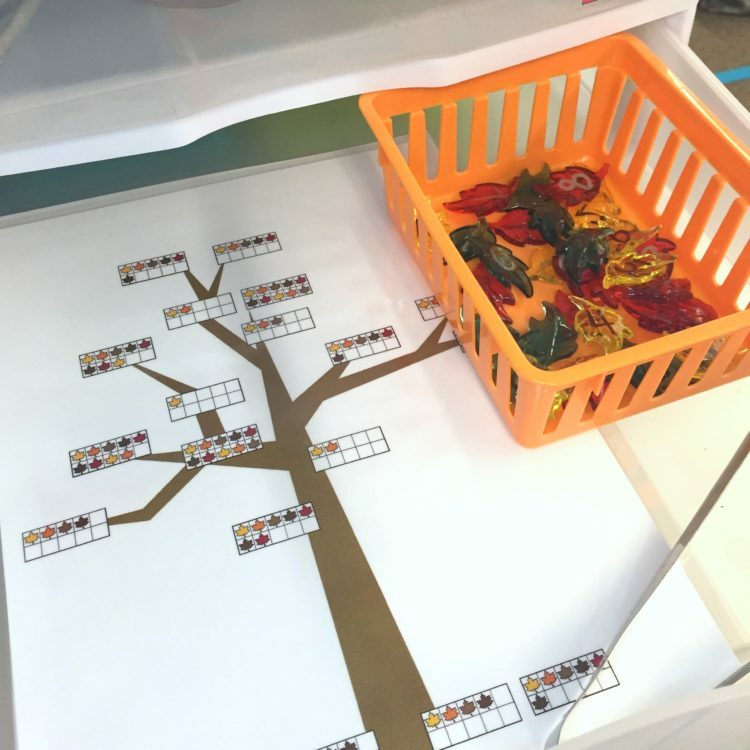 For this game, I made these ten frame trees and found this great fall scatter that I thought would be a fun manipulative to use with tongs. The trees have a variety of ten frame numbers on the branches and ground. 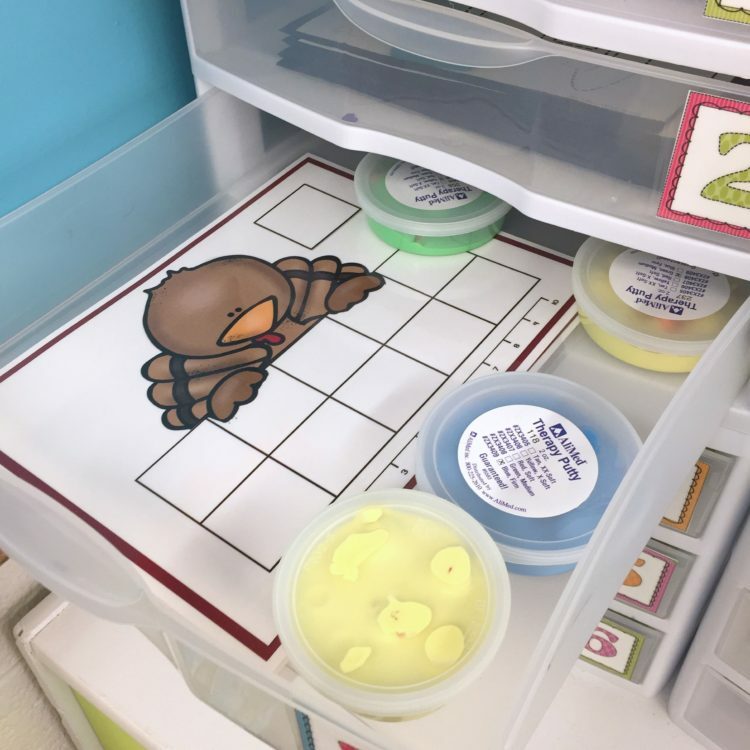 Without looking, students will pick up a leave from the basket, identify the number written on it (I did it with silver and black Sharpies), and then place that leaf on the matching ten frame. If they pull a number and there are no spaces left with that number, then they lose their turn. The student who covers all their ten frames first is the winner. You can get a copy of the trees below. I even ordered the ones with letters, but alas . . . they were all capitals so I ordered some flat ones and wrote lowercase letters on them. When students come to this station they grab the word card with the ball words that they are currently studying. They will make the words on the card and they use a dry erase marker to mark them off as they complete them. I told you I love this autumn table scatter and I really wanted to use it a lot so this game is a simple dice game. (You’ll even find it in my sensory tables!) some of my students are still trying to master numbers 0-10, they will use a numbered 1-10 die. My other students will use a dice in a dice. 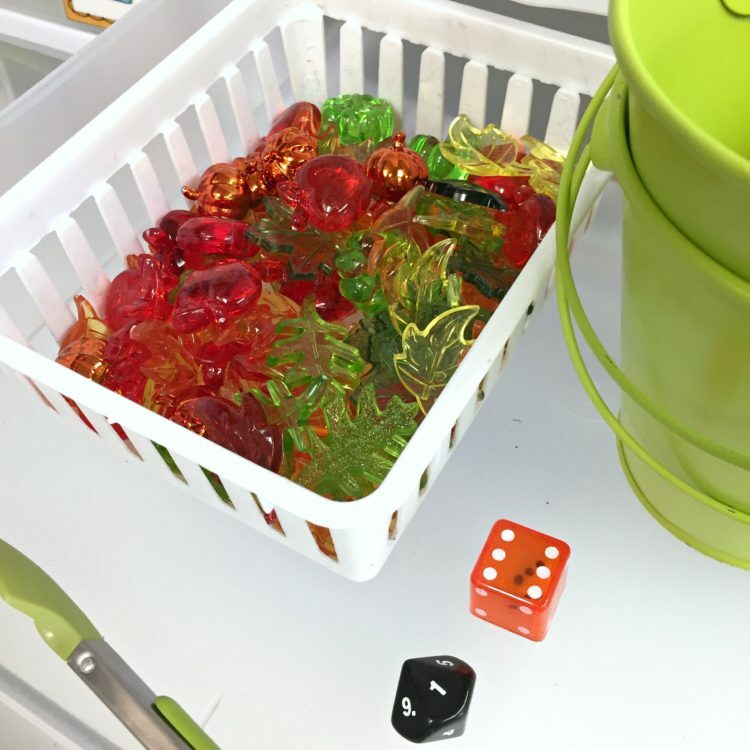 Students roll and read the number (or add in the case of the die in a die) and using tongs place that many leaves or fall items in their bucket. If they drop the item on the way to the bucket, they lose it. 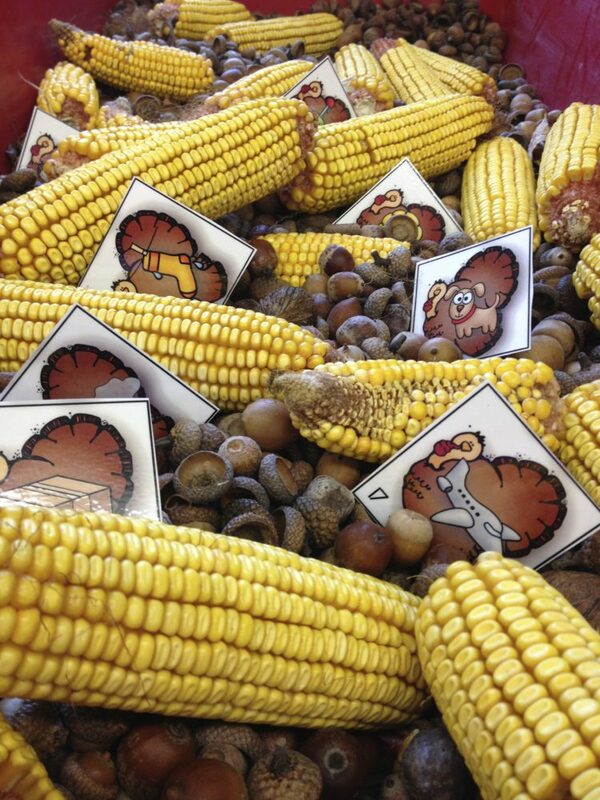 Every year, without fail, I have feed corn for my students to shuck in my sensory table. And . . . they are obsessed with it. It’s great for their little fingers. So this year, in addition to sensory shucking, I have corn in my morning work drawers but this time they will use tweezers to collect their corn. 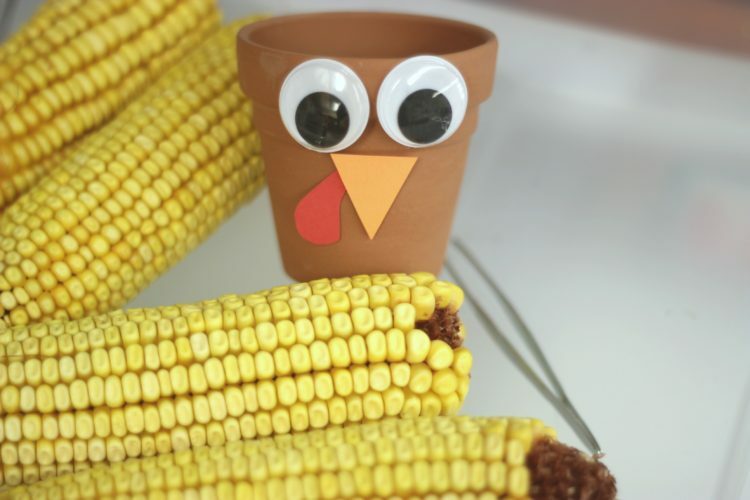 All the little pieces of corn they collect will be ‘fed’ to their turkey. I made the turkeys out of little terra-cotta pots I found. Really simple. 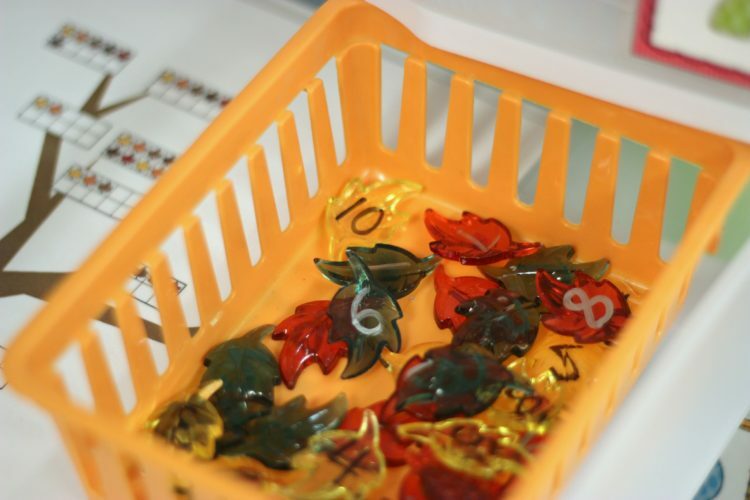 When they are done, they can compare the amount they collect with a simple scale or count the pieces. 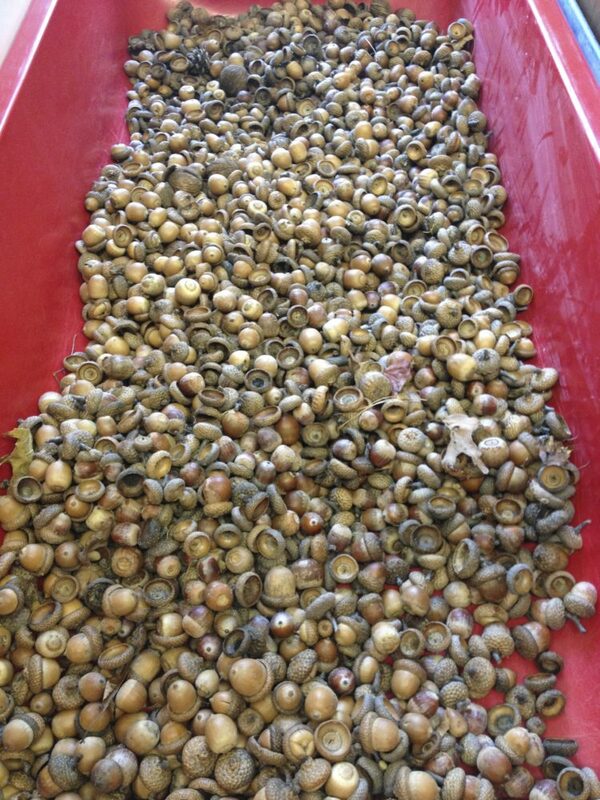 Usually in Northern Michigan I can collect literally bushels of acorns right in my front yard. I mean this is our usual bounty each year. Even when they were teeny little buggers, I would put the boys to work and I almost always would have enough to put in my sensory table. I have two baskets. One basket holds acorns with numbers 1-10 and the other basket holds acorns 1-25. 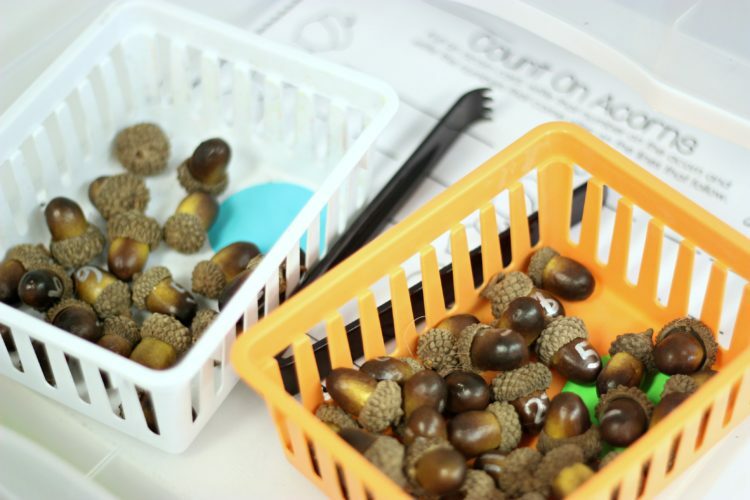 Students can either play this as a game where they pick an acorn without looking using a tong and compare it with their partner. 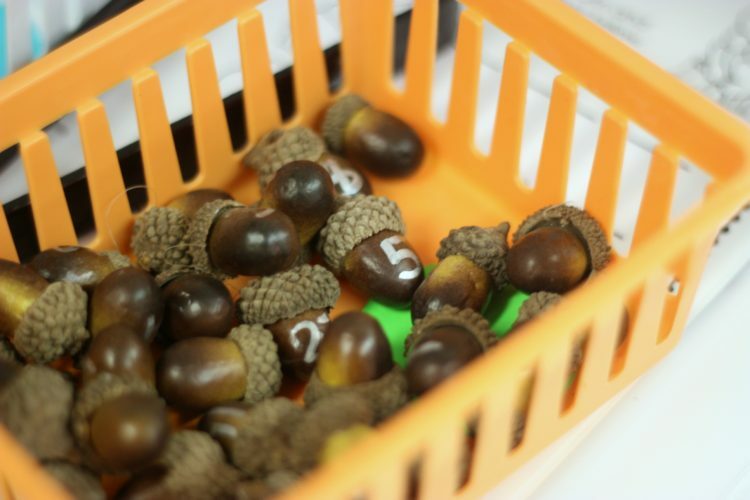 Person with the greater (or lesser) number gets to keep both acorns and put them in their bucket. Or . . . they can grab an acorn with the tongs, and write the number on the recording sheet and then write the numbers that come after. 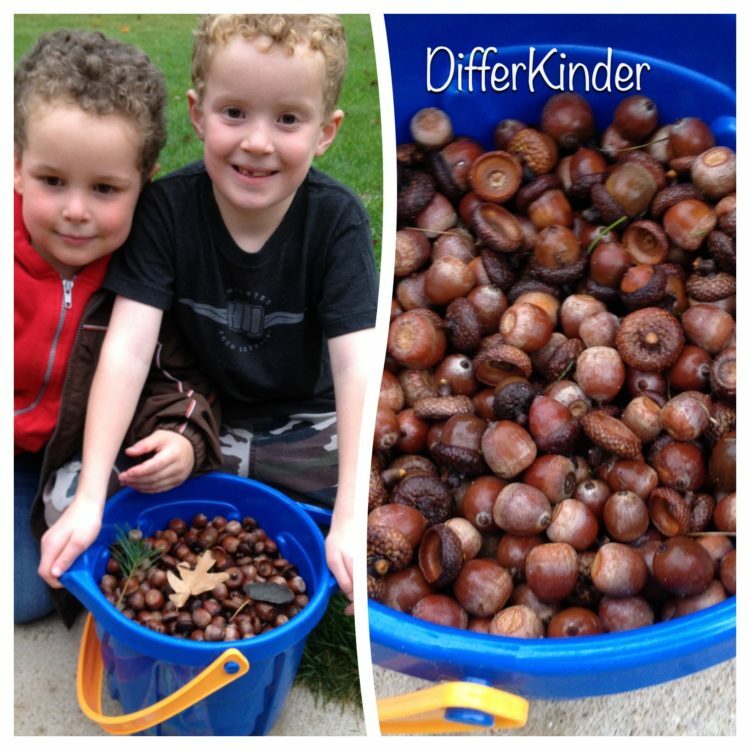 Both activities address skills that my kinders need practice with so I am ok with whichever they choose. So that’s it for this month. As always, I will be posting them in action so you can see how they look with students actually using them. If you’d like to check my previous morning work stations for September and October, just click on the links HERE and HERE. Also, while not all the resources associated with these are free, a few of them are and you can pick them up by grabbing them below. Just click on the button below and enter your email address. Once that happens, a confirmation note will be sent to your inbox. Once you confirmation your subscription to my newsletter, then the file will be downloaded to your computer. Just check your computer’s ‘download’ file. You should find it there. If you don’t get the note, check your SPAM folder. It sometimes like to go there instead. UPDATE: After spending the last year posting about morning work and presenting workshops to teachers across the country, I had numerous special requests from teachers who required more than just 12 stations, ‘I Can’ sheets with standards and skills indicated and who had numerous questions. 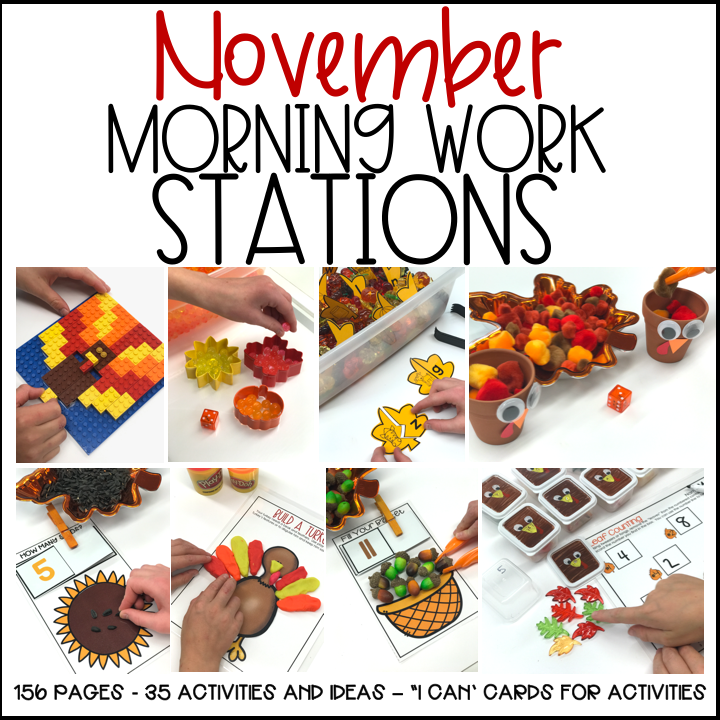 Taking all those requests and questions, I put together a Getting Started With Morning Stations packet and now an expanded October and November Work Stations packet with over 35 Morning Work Station Activities. If you’d like to learn more about the getting started packet, just click HERE. Or click on the picture below to find out more about November. They look wonderful Marsha! 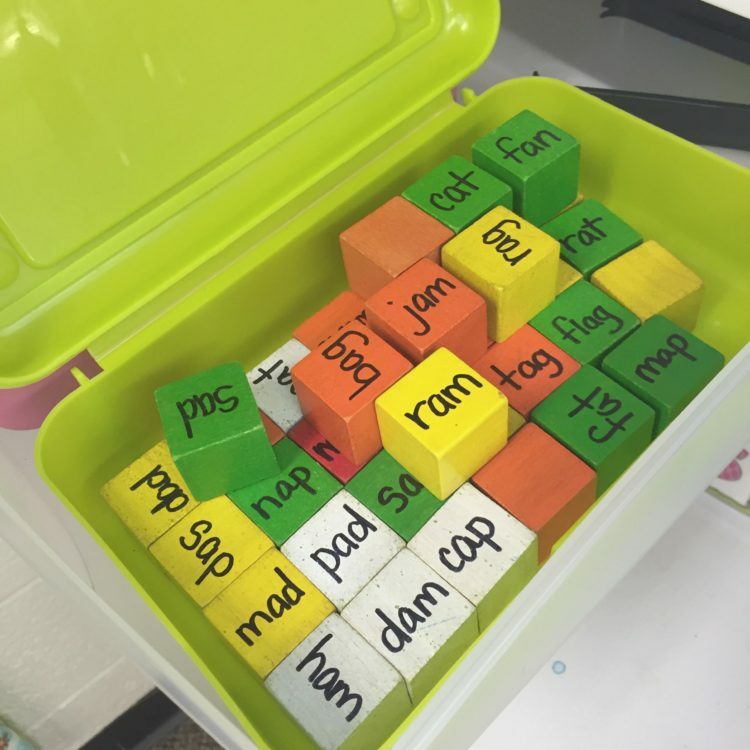 Your students are going to love these bins this month. I hope all goes well with your son today. Hi, i love your website! According t my just turned 5 year olds teacher, he needs help with fine motor work at home. How long do you suggest they work at each station at home? How many stations a day? I also want to incorporate some tracing. He goes to pk4 from 8-12 5 days a week. No more than 10 or 15 minutes on any one activity. They are 5 and their attention span is limited. He should be getting lots of it in preK too. 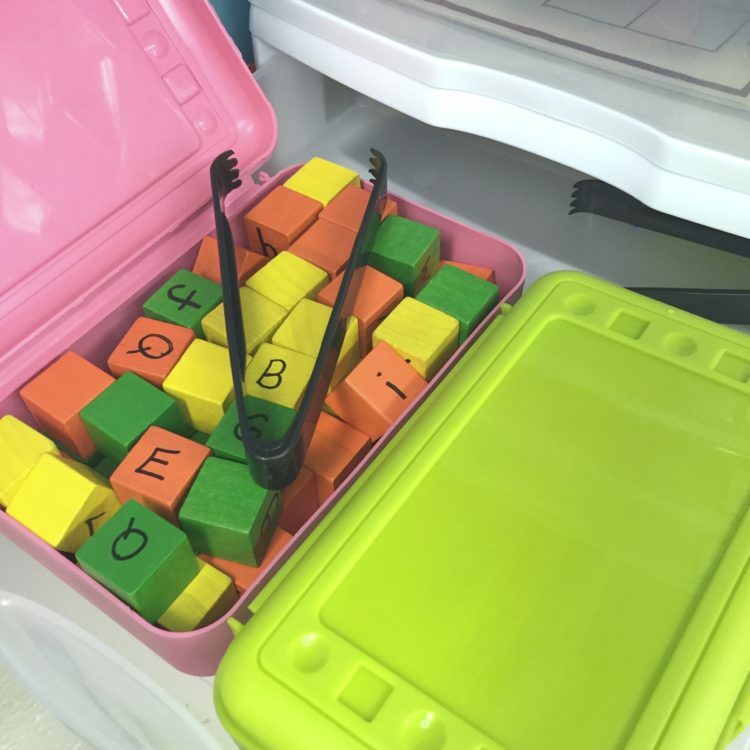 I have been looking for a way to organize my morning work and this is the best! Thank you for sharing all of your monthly ideas, too! 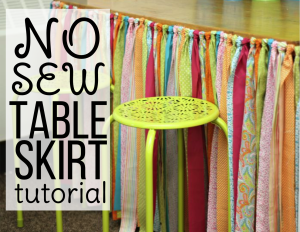 I love to make all of my work relate to the theme…and these are perfect and so much fun for the kiddos! I appreciate all of your hard work collecting and creating these ideas! Awesome once again!!! 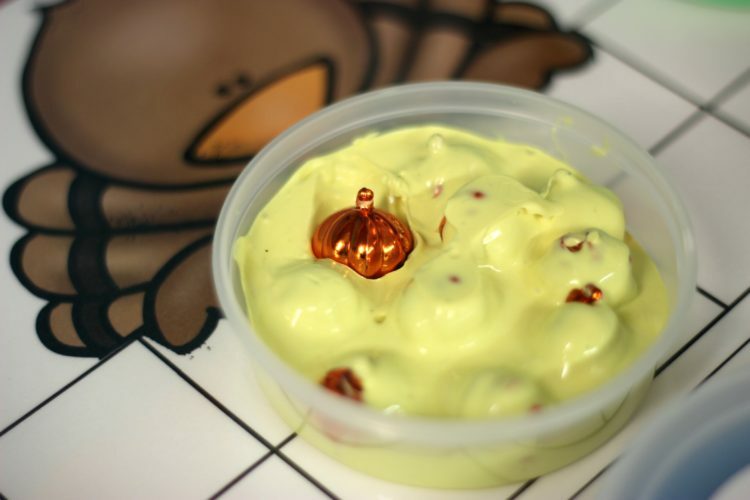 Is there a link for the pokey pin things? 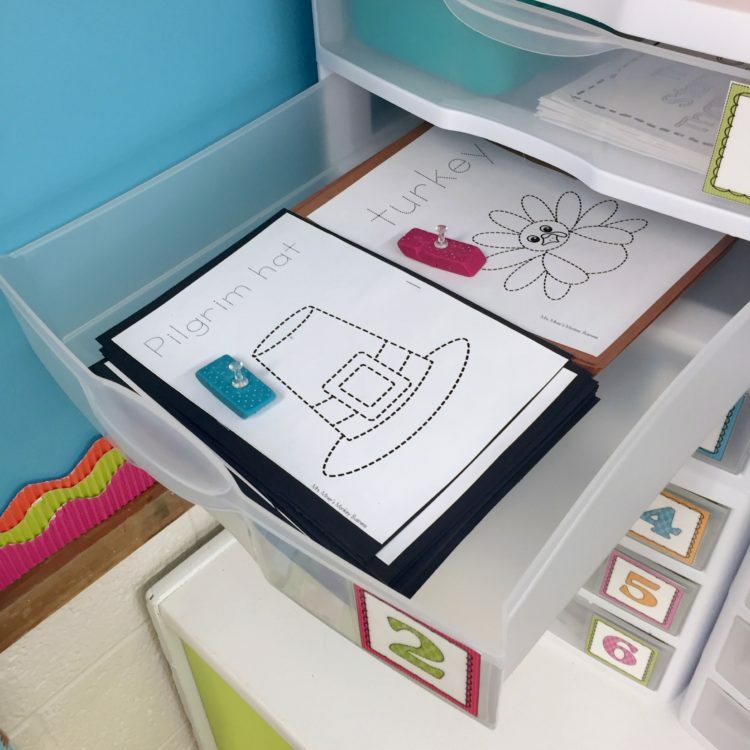 My kids LOVE my fine motor drawers. These will be great additions! No problems here. 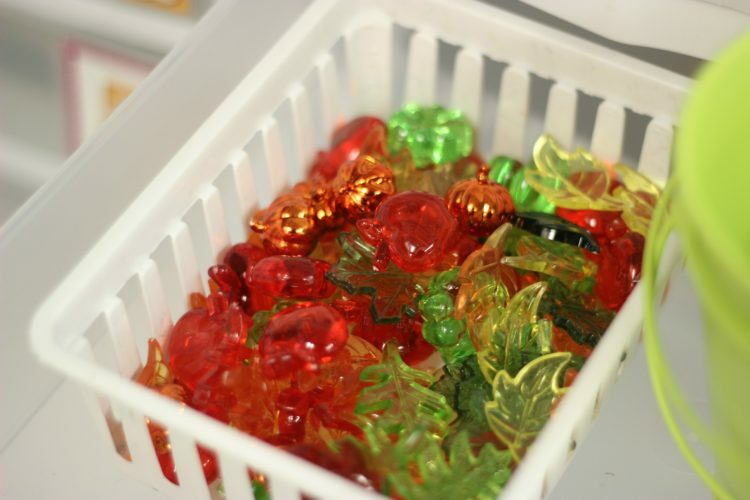 I always put them in a plastic bag and stick them in the freezer for a couple of days. No Bugs!!! Thank you for these fun ideas.